"S'muttonator is a tasty mixture of German ingredients and good ol' fashioned New England tenaciousness. Our brewers take 30 hours to brew a single batch of this traditional Double Bock. Take your time and enjoy its rich, malty, and deceptively smooth flavor." 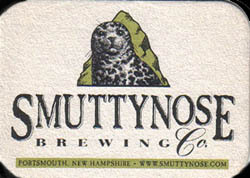 -- Smuttynose Brewing Co.
We didn't love this one or hate it. The only distinguishable aroma was of a red wine, as well as alcohol. Pours a dark amber color with a large, fizzy off-white head. Hazy body. Both lightly sweet and acidic on the intial taste. Chalky residue on the finish. This beer seems like it wants to be sweet, but its not due to the overpowering alcohol taste. No malt aroma, but a malty taste.